Christmas Ornaments Made in USA - 2009 Mount Vernon 250th Anniversary Ornament - A Christmas Ornament Co. Celebrate the 250th anniversary of the wedding between George and Martha Washington with the 2009 Mount Vernon holiday ornament. George and Martha Washington were married January 6, 1759 at the White House Plantation, in New Kent County, Virginia. George and Martha Washington moved into Mount Vernon in the spring of 1759 and lived at the estate for their entire marriage. 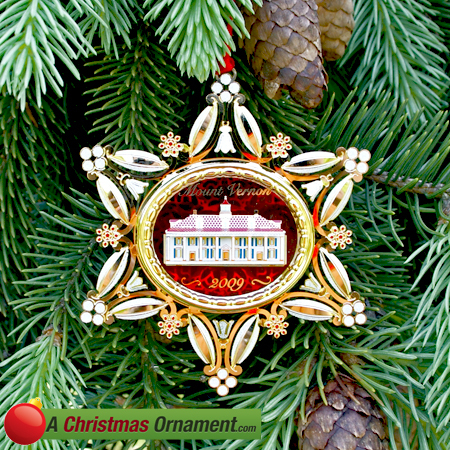 This beautiful Christmas tree ornament is two-sided with 3-D view of Mount Vernon’s famous East Front and the year “2009” printed on the front inside of a snowflake. The back of the 2009 Mount Vernon holiday ornament shows George Washington’s cipher.